How Does a Spider Spin It's Web? Throughout the world you will find many types of spiders. Yet, even with such a wide variety of spiders there are only three types of silk produced by all spiders that are used to create spider webs. All spiders produce a sticky silk that is used to build webs. The stickiness of this particular silk helps to catch and trap prey for the spider. 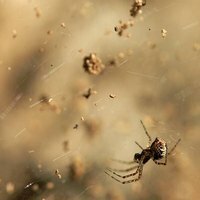 A stronger non-sticky silk is also produced by spiders and used within the structure of the web to provide a way for the spider building the web to traverse without getting tangled in it's own trap. This silk is also used to anchor the web down. A third type of silk is used for building their cocoons. Spiders are not insects. They differ from insects in that they have eight legs, eight eyes, no wings and only two sections to their bodies. One of the sections of the spider's body produces silk. The abdomen of the spider is where the production of the silk begins. At the top of the abdomen are spinning organs. This spinning organ contains tiny holes and the silk is pressed through the holes like a sieve. The silk is in liquid form when it is squeezed through the holes, but turns to solid form as soon as it is exposed to air. This forms the silk for webs. The climate and environment a spider lives in determines the type of silk it produces, where it will build its web and the type of web it will build. The most common web is the wheel shaped web. The spider begins by building a frame. It creates four sides to the web and then two diagonal lines from the four corners. This frame will give the web strength. The spider makes the "spokes'"of the wheel by creating lines from the outside edges in towards the center of the web. Once all the "spokes'" are made the spider goes back over the web creating spirals from the outside in using the sticky silk which will then trap it's prey in the web.